Wed., July 25, 2018, 6:36 p.m.
KHARTOUM, Sudan – South Sudan’s warring leaders have agreed to share power once again in the latest effort to end a five-year civil war, officials announced Wednesday, days after the United States said it was “skeptical” the two men whose rivalry has killed tens of thousands could lead the way to peace. 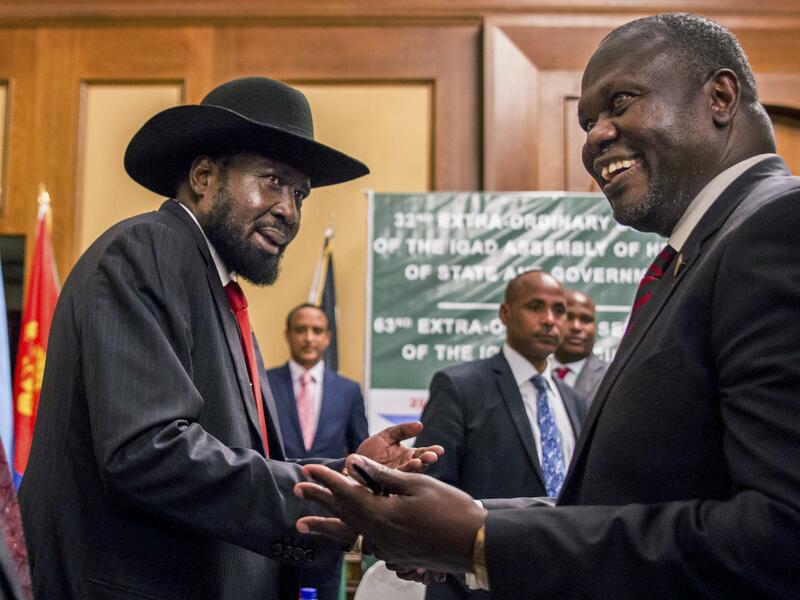 South Sudan’s information minister, Michael Makuei Lueth, announced the agreement between President Salva Kiir and armed opposition leader Riek Machar to reporters in Sudan’s capital, Khartoum. The agreement initialed Wednesday will be signed on Aug. 5, Sudan’s Foreign Minister Al-Dirdiri Mohamed Ahmed said. Kiir will lead South Sudan’s government during a transitional period and Machar will return as first vice president, Sudan’s official SUNA news agency reported. The opposition can “live with” the agreement, but it will fail if early steps such as security arrangements aren’t implemented, Manasseh Zindo, who has been directly involved with the negotiations for Machar’s group, told The Associated Press. A similar arrangement, however, fell apart in July 2016 when fighting erupted in the capital, Juba, and Machar fled the country on foot. The civil war broke out in December 2013 between supporters of Kiir and his then-deputy Machar. More than 2 million people have since fled the country in Africa’s largest refugee crisis since the Rwandan genocide in 1994, while millions of others have been left near famine. Multiple cease-fires, including a “permanent” one signed by Kiir and Machar weeks ago, have been violated within hours. Meanwhile, both sides have been accused of abuses. A U.N. report this month described how government troops and allied forces hung people from trees, burned others alive and raped or gang-raped dozens of women and girls. The new agreement comes as South Sudan’s leaders are under growing pressure from an impatient international community to end the fighting. Under the threat of a U.N. arms embargo Kiir and Machar agreed to resume talks in June, their first face-to-face discussions in nearly two years. Earlier this month the U.N. Security Council imposed the arms embargo anyway. The fracturing of South Sudan’s opposition into multiple groups further challenges the new power-sharing agreement as some refuse to sign on. Machar will be among five vice presidents in the new transitional government, according to the 11-page agreement. The government will include 20 ministers from Kiir’s government, nine from Machar’s group and six from other groups. The warring sides also have agreed to share a 550-seat parliament with 332 members from Kiir’s government, 128 from Machar’s group and the rest from other groups. Some South Sudanese who have seen past peace deals come and go reacted to the latest news with wariness. “Working relations between Kiir and Machar is at its lowest level ever and chances of the duo causing another regrettable wave of violence are high,” said Wol Deng Atak, the editor of a newspaper that was forcibly shut down by the government and who now lives in exile. Published: July 25, 2018, 6:36 p.m. Updated: July 25, 2018, 3:32 p.m.